Now by the time most of you will be reading this story, the bakery at the Creameries on Wilbraham Road will be open for all those who like good bread. And if by chance you are reading it on Wednesday, then you may just want to call in for breakfast because the Cafe will have opened. I like the way that what was once a creamery has gone almost full circle and in the process a little of its history is now revealed, because after posting a story last week Paul and Chris got in touch with their own stories. 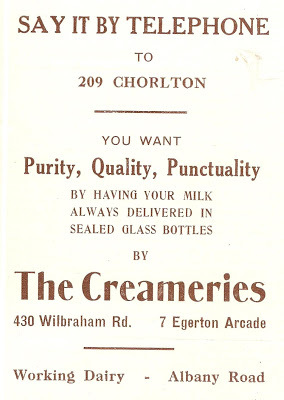 From Paul came, “my wife Leslie Valentine Dunleavy was born in Chorlton shortly after her dad, D.A Dunleavy acquired the Creamery in 1951. Leslie sometimes worked in the shop, and her mum used to play Tennis at the Chorlton Club with Annie Walkers " Rovers Return " mother. 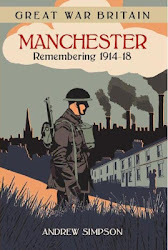 My own connection with Chorlton is that my maternal grandmother’s first husband was named Charles Chorlton, his father a Chorlton and his mother a Hardy, they sold up in Chorlton and moved to Hanley to open a Theatrical Boarding house for the artistes of Music Hall”. Now that opens ups a fascinating story for the future. But returning to the Creameries, Chris had done some detective work and discovered that “I tracked their telephone directory entries from 1928 and the last entry is for 1961. Unfortunately the database for 1962 is corrupt but there was no entry for 1963”. And that fits nicely with an advert they placed in the parish magazine for 1928 and a listing for them at the same time place in 1969. All of which leads nicely to Paul’s last thought, that when the family are next passing, “it will be great for three generations to walk into the newly incarnated Creameries in memory of the Dunleavy era and to reflect that Leslie’s dad had been born next door in 1914”. I am sure there will be more to uncover, but for now I like the sense of continuity in the story. 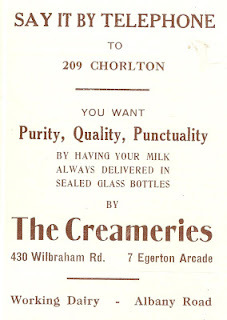 Like Paul I will zippy down to the Creameries to sample the food and get a bit more of that continuity.